Born and raised in Central Pennsylvania, Pete has a deep appreciation for and understanding of the traditions and values of the people from our area. He is a graduate of Williamsport High School and earned a Bachelor's degree from Ursinus College in Collegeville, Pennsylvania. He earned his Certified Financial Planning (CFP®) designation in 1986. After college he was drafted into the United States Army and served overseas with the 2nd Battalion's 36th Infantry. 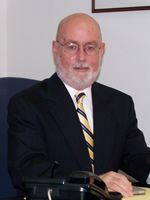 Upon returning home, he embarked on a career in banking with the Williamsport National Bank in Williamsport, PA. Later he moved his family to Shamokin Dam, PA and worked for the Snyder County Trust Company until 2003. In January of 2004 , Pete became a founding partner in 18th Street Financial Services LLP. Selinsgrove, PA. Licensed in general Securities, Insurance and as an Investment Advisor Representative, Pete can apply his Financial Services experience and 30 years as a Certified Financial Planner (CFP®) practitioner to assist clients with planning for retirement. He resides in Shamokin Dam, PA and Pete and his wife Penny have two grown sons who are successful entrepreneurs. Pete and Penny have been active in many organizations including church, business related groups, sports boosters clubs and in their spare time they enjoy boating. Robin Feltman joined 18th Street Financial Services, LLP as general partner in July of 2017. She was originally employed by 18th Street Financial Services, LLP in 2007, and developed a broad knowledge of financial services. She is licensed to provide Life Insurance, Annuities, Health Insurance, Long Term Care Insurance, and senior health products such as Medicare Supplement policies and Prescription Drug Plans. Robin is available to assist clients with retirement income solutions, life insurance needs and the health insurance needs of those 65 years of age and older. Robin earned her Bachelor of Business Administration and Management Information Systems degree from Valdosta State University in Valdosta Georgia. Prior to moving to the Susquehanna Valley over twenty years ago, she was employed as a Computer Systems Analyst and technical writer for the Department of Veterans Affairs in Washington, D.C. She has also worked as a freelance writer. Growing up in a military family, she has lived in a variety of locations, from Charleston, South Carolina to Germany and the United Kingdom. As such, she brings a comprehensive blend of skills and experiences to 18th Street Financial Services. She enjoys getting to know her clients and offering creative solutions to help meet their personal financial needs and goals. She resides in Snyder County, PA. And though she firmly believes in the importance of proper financial planning, Robin still believes that many of the best things in life are free. Consequently, she and her husband, Vincent, can be spotted most weekends somewhere along on one of Central Pennsylvania's many hiking trails, enjoying the the abundant natural beauty of the state she now calls home.